Edward Whymper (27 April 1840 – 16 September 1911) was an English mountaineer, explorer, illustrator, and author best known for the first ascent of the Matterhorn in 1865. Four members of his climbing party were killed during the descent. Whymper also made important first ascents on the Mont Blanc massif and in the Pennine Alps, Chimborazo in South America, and the Canadian Rockies. His exploration of Greenland contributed an important advance to Arctic exploration. 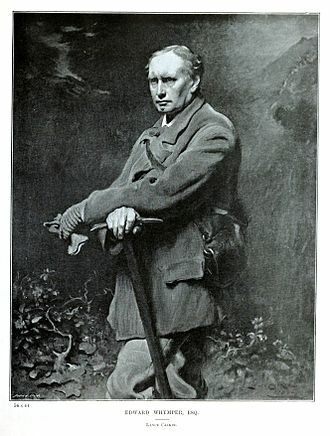 Whymper wrote several books on mountaineering, including Scrambles Amongst the Alps. 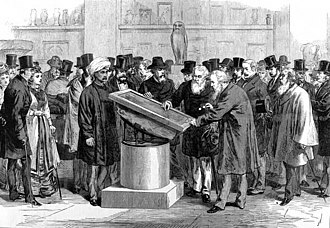 Edward Whymper was born in London, England, on 27 April 1840 to the artist and wood engraver Josiah Wood Whymper and Elizabeth Claridge. He was the second of eleven children, his older brother being the artist and explorer Frederick Whymper. He was trained to be a wood-engraver at an early age. In 1860, he made extensive forays into the central and western Alps to produce a series of commissioned alpine scenery drawings. Among the objects of this tour was the illustration of an unsuccessful attempt made by Professor Bonney's party to ascend Mont Pelvoux, at that time believed to be the highest peak of the Dauphiné Alps. In 1861, Whymper successfully completed the ascent of Mont Pelvoux, the first of a series of expeditions that threw much light on the topography of an area at that time very imperfectly mapped. 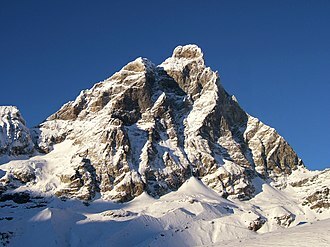 From the summit of Mont Pelvoux, Whymper discovered that it was overtopped by a neighbouring peak, subsequently named the Barre des Écrins, which, before the annexation of Savoy added Mont Blanc to the possessions of France, was the highest point in the French Alps. Whymper climbed the Barre des Écrins in 1864 with Horace Walker, A. W. Moore and guides Christian Almer senior and junior. 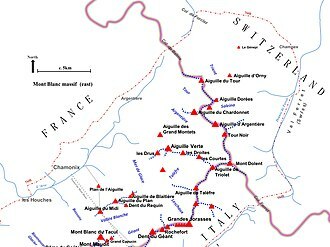 The years 1861 to 1865 were filled with a number of new expeditions in the Mont Blanc massif and the Pennine Alps, among them the first ascents of the Aiguille d'Argentière and Mont Dolent in 1864, and the Aiguille Verte, the Grand Cornier and Pointe Whymper on the Grandes Jorasses in 1865. That year he also made the first crossing of the Moming Pass. According to his own words, his only failure was on the west ridge of the Dent d'Hérens in 1863. As a result of his Alpine experience, he designed a tent that came to be known as the "Whymper tent" and tents based on his design were still being manufactured 100 years later. Professor John Tyndall and Whymper emulated each other in determined attempts to reach the summit of the Matterhorn by the south-western, or Italian, ridge. In 1865, Whymper, who had failed eight times already, attempted unsuccessfully to climb a couloir on the south-east face with Michel Croz. After Croz left for a prior engagement with Charles Hudson, Whymper was unable to secure the services of Val Tournanche guide Jean Antoine Carrel, and instead planned to try the eastern face with Lord Francis Douglas and the two Zermatt guides, Peter Taugwalder father and son. 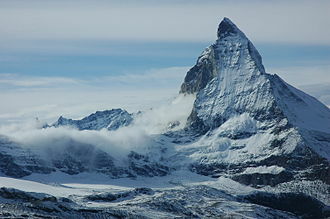 Whymper was convinced that the Matterhorn's precipitous appearance when viewed from Zermatt was an optical illusion, and that the dip of the strata, which on the Italian side formed a continuous series of overhangs, should make the opposite side a natural staircase. This party of four was joined by Hudson and Croz, and the inexperienced Douglas Hadow. 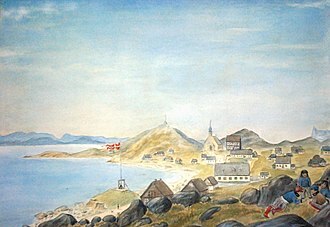 Their attempt by what is now the normal route, the Hörnli ridge, met with success on 14 July 1865, only days before an Italian party. On the descent, Hadow slipped and fell onto Croz, dislodging him and dragging Douglas and Hudson to their deaths; the rope parted, saving the other three. Whymper's 1865 campaign had been planned to test his route-finding skills in preparation for an expedition to Greenland in 1867. The exploration in Greenland resulted in an important collection of fossil plants, which were described by Professor Heer and deposited in the British Museum. Whymper's report was published in the report of the British Association of 1869. Though hampered by a lack of supplies and an epidemic among the local people, he proved that the interior could be explored by the use of suitably constructed sledges, and thus contributed an important advance to Arctic exploration. Another expedition in 1872 was devoted to a survey of the coastline. Whymper next organised an expedition to Ecuador, designed primarily to collect data for the study of altitude sickness and the effect of reduced pressure on the human body. His chief guide was Jean-Antoine Carrel, who later died from exhaustion on the Matterhorn after bringing his employers into safety through a snowstorm. During 1880, Whymper made two ascents of Chimborazo (6,267m), claiming the first ascent, though Alexander von Humboldt had ascended the volcano in 1802. He spent a night on the summit of Cotopaxi and made first ascents of Sincholagua, Antisana, Cayambe, Sara Urco and Cotacachi. In 1892, he published the results of his journey in a volume entitled Travels amongst the Great Andes of the Equator. His observations on altitude sickness led him to conclude that it was caused by a reduction in atmospheric pressure, which lessens the value of inhaled air, and by expansion of the air or gas within the body, causing pressure upon the internal organs. The effects produced by gas expansion may be temporary and dissipate when equilibrium has been restored between the internal and external pressure. The publication of his work was recognised on the part of the Royal Geographical Society by the award of the Patron's medal. His experiences in South America having convinced him of certain serious errors in the readings of aneroid barometers at high altitudes, he published a work entitled How to Use the Aneroid Barometer and succeeded in introducing important improvements in their construction. He afterwards published two guide books to Zermatt and Chamonix. While in Ecuador, Whymper made a collection of amphibians and reptiles that he handed over to George Albert Boulenger at the British Museum. The collection received some praise from Boulenger, who said that "though containing no striking novelties", the collection was "interesting on account of the care bestowed by its collector in recording the exact locality from which every specimen was obtained". Boulenger described four new species from the materials, three of them named after Whymper: snake Coronella Whymperi (now a junior synonym of Saphenophis boursieri) and frogs Prostherapis Whymperi, Phryniscus elegans, and Hylodes Whymperi (now a junior synonym of Pristimantis curtipes). In the early 1900s, Whymper visited the Canadian Rockies several times and made arrangements with the Canadian Pacific Railway (CPR) to promote the Canadian Rockies and the railway in his talks in Europe and Asia. In exchange, the CPR agreed to pay transportation costs for him and his four guides. In 1901, Whymper and his four guides (Joseph Bossoney, Christian Kaufmann, Christian Klucker and Joseph Pollinger) made the first ascents of Mount Whymper and Stanley Peak in the Vermilion Pass area of the Canadian Rockies. His brother Frederick also has a mountain in British Columbia named after him, from his days as artist illustrator with the Robert Brown's Vancouver Island Exploring Expedition in 1864. When not climbing, Whymper pursued his profession as an engraver of illustrations for books and periodicals. Among the books he illustrated was his fellow-mountaineer Florence Crauford Grove's The Frosty Caucasus (1875) Whymper also illustrated and engraved John Tyndall's "Hours of Exercise in The Alps" (1871). He illustrated books for Isabella L. Bird but his brother Charles Whymper was the designer of the Henrietta Amelia Bird memorial clock tower in Tobermory, Isle of Mull, Scotland. It was built in 1905, funded by Isabella Bird (Mrs. Bishop) in memory of her sister. On 25 April 1906, Whymper married Edith Mary Lewin (born 1883) at Emmanuel Church in Forest Gate, London. The service was presided over by Canon J. M'Cormick, who had assisted the mountaineer after the Matterhorn accident. The marriage produced one daughter, Ethel. The couple were separated in 1910. Edith remarried in 1913 and died the following year from complications of pregnancy. Shortly after returning to Chamonix from another climb in the Alps, Whymper became ill, locked himself in his room at the Grand Hotel Couttet, and refused all medical treatment. 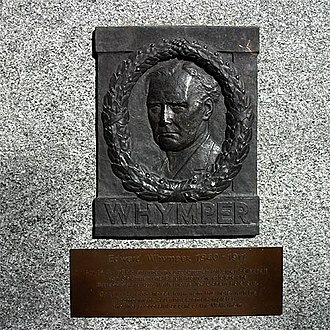 Whymper died alone on 16 September 1911, at the age of 71. A funeral was held four days later. He is buried in the English cemetery in Chamonix. Scrambles Amongst the Alps: In the Years 1860–69. London: John Murray, 1871. ISBN 978-0898150438. Winter Pictures: By Poet and Artist. London: Religious Tract Society, 1875. The Ascent of the Matterhorn. London: John Murray, 1880. ISBN 978-0862993474. How to Use the Aneroid Barometer. London: John Murray, 1881. Travels Amongst the Great Andes of the Equator. London: John Murray, 1891. ISBN 978-0879052812. Chamonix and the Range of Mont Blanc: A Guide. London: John Murray, 1896. The Valley of Zermatt and the Matterhorn: A Guide. London: John Murray, 1897. The Apprenticeship of a Mountaineer: Edward Whymper's London Diary, 1855–1859. Ed. Ian Smith. London: London Record Society, 2008. ISBN 978-0900952432. ^ Fleming, Fergus (3 November 2000). "Cliffhanger at the top of the world". The Guardian. ^ "Blueplaque commemorates Matterhorn climber Edward Whymper". The Guardian. 15 September 2011. ^ "This was the only mountain in the Alps that I have essayed to ascend, that has not, sooner or later, fallen to me. Our failure was mortifying ..." Quoted in Dumler, Helmut and Willi P. Burkhardt, The High Mountains of the Alps, London: Diadem, 1994, p. 157. ^ Edward Whymper, Scrambles amongst the Alps, 1872. ^ "Alexander von Humboldt: A Chronology from 1769 to 1859" in Personal Narrative of a Journey to the Equinoctial regions of the New Continent by Alexander von Humboldt. London: Penguin Classics 1995, p. lxviii. ^ a b Boulenger, G. A. (1882). "Account of the reptiles and batrachians collected by Mr. Edward Whymper in Ecuador in 1879–80". Annals and Magazine of Natural History. Series 5. 9: 457–467. ^ Beolens, Bo; Watkins, Michael; Grayson, Michael (2013). The Eponym Dictionary of Amphibians. Pelagic Publishing. ISBN 978-1-907807-44-2. 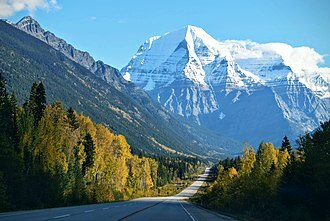 ^ "Mount Whymper (Edward)". BC Geographical Names. ^ "Mount Whymper British Columbia #1562". Bivouac.com. Archived from the original on 21 March 2016. Retrieved 2 June 2012. ^ "Whymper, Frederick". Dictionary of Canadian Biography Online. University of Toronto/Université Laval. 2000. Retrieved 19 May 2012. ^ "Mount Whymper (Frederick)". BC Geographical Names. ^ "Brown, Robert". Dictionary of Canadian Biography Online. University of Toronto/Université Laval. 2000. Retrieved 2 June 2012. ^ "Among the Tibetans". Project Gutenberg. ^ "THE LIFE OF ISABELLA BIRD (MRS. BISHOP) BY ANNA M. STODDART". Project Gutenberg. ^ "DSA Architect Biography Report: Charles Whymper". scottisharchitects.org.uk. Dictionary of Scottish Architects. Archived from the original on 9 April 2017. ^ a b c "Marriage to Edith Mary Lewin". Whymper.com. Archived from the original on 12 November 2013. Retrieved 12 November 2013. ^ Lewin, Greg. "Edith and the Mountaineer". Greg's Family History. Retrieved 2 February 2016. ^ a b c "Death of Edward Whymper". Whymper.com. Archived from the original on 12 November 2013. Retrieved 12 November 2013. ^ "Whymper Expected End". The New York Times: 4. 18 September 1911. ^ "Review of Travels amongst the Great Andes of the Equator by Edward Whymper and Mountaineering by C. T. Dent". The Quarterly Review. 175: 348–371. October 1892. Gos, Charles (1948). "The Matterhorn Catastrophe". Alpine Tragedy. Trans. Malcolm Barnes. New York City: Charles Scribner's Sons. pp. 24–34. Lyall, Alan (1997). The First Descent of the Matterhorn. (Privately). Llandysul: Gomer Press. Smith, Ian M. (2011). Shadow of the Matterhorn: the life of Edward Whymper. Carreg. ISBN 978-0-9563163-1-8. Smythe, Frank S (1940). Edward Whymper. Hodder and Stoughton. Wikimedia Commons has media related to Edward Whymper. 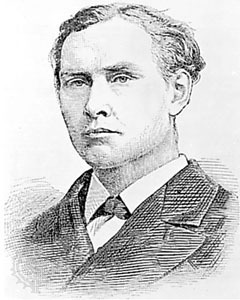 Edward Whymper (1892). Travels Amongst the Great Andes of the Equator. Friedrich Wilhelm Heinrich Alexander von Humboldt was a Prussian geographer, naturalist and influential proponent of Romantic philosophy and science. He was the brother of the Prussian minister, philosopher. 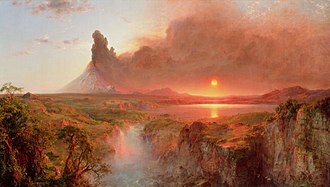 Humboldts quantitative work on botanical geography laid the foundation for the field of biogeography, Humboldts advocacy of long-term systematic geophysical measurement laid the foundation for modern geomagnetic and meteorological monitoring. 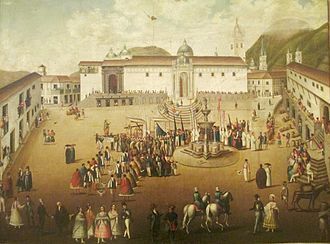 Between 1799 and 1804, Humboldt travelled extensively in Latin America and his description of the journey was written up and published in an enormous set of volumes over 21 years. Humboldt was one of the first people to propose that the lands bordering the Atlantic Ocean were once joined and this important work motivated a holistic perception of the universe as one interacting entity. Alexander von Humboldt was born in Berlin in Prussia on 14 September 1769 and he was baptized as a baby in the Lutheran faith, with the Duke of Brunswick serving as godfather. At age 42, Alexander Georg was rewarded for his services in the Seven Years War with the post of Royal Chamberlain and he profited from the contract to lease state lotteries and tobacco sales. He first married the daughter of Prussian General Adjutant Schweder, in 1766, Alexander Georg married Maria Elisabeth Colomb, a well-educated woman and widow of Baron Hollwede, with whom she had a son. Alexander Georg and Maria Elisabeth had three children, a daughter, who died young, and two sons and Alexander and her first-born son and Alexanders half-brother, was something of a neer do well, not often mentioned in the family history. Alexander Georg died in 1779, leaving the brothers Humboldt in the care of their emotionally distant mother, Humboldts mother expected them to become civil servants of the Prussian state. The money Baron Holwede left to Alexanders mother became, after her death, instrumental in funding Alexanders explorations, due to his youthful penchant for collecting and labeling plants and insects, Alexander received the playful title of the little apothecary. On April 25,1789, he matriculated at Göttingen, known for the lectures of C. G. Heyne and his brother Wilhelm was already a student at Göttingen, but they did not interact much since their intellectual interests were quite different. His vast and varied interests were by this time fully developed, at Göttingen he met Georg Forster, a naturalist who had been with Captain James Cook on his second voyage. Humboldt traveled with Forster in Europe, the two traveled to England, Humboldts first sea voyage, The Netherlands, and France. In England, he met Sir Joseph Banks, President of the Royal Society, the scientific friendship between Banks and Humboldt lasted until Bankss death in 1820, and the two shared botanical specimens for study. Banks mobilized his scientific contacts in years to aid Humboldts work, Humboldts scientific excursion up the Rhine resulted in his 1790 treatise Mineralogische Beobachtungen über einige Basalte am Rhein. Humboldts passion for travel was of long standing, Humboldts talents were devoted to the purpose of preparing himself as a scientific explorer. Douglas, Hudson and Croz were killed on the descent when Hadow slipped and pulled the other three with him down the north face. The ascent followed a series of usually separate attempts by Edward Whymper. Carrels group had been 200 m below the summit on the Italian site when Croz, the climbers from Valtournenche withdrew deflated, but three days Carrel and Jean-Baptiste Bich reached the summit without incident. The Matterhorn was the last great Alpine peak to be climbed, in the summer of 1860, Edward Whymper, an athletic, twenty-year-old English artist, visited the Alps for the first time. He had been hired by a London publisher to make sketches and engravings of the mountains along the border of Switzerland. 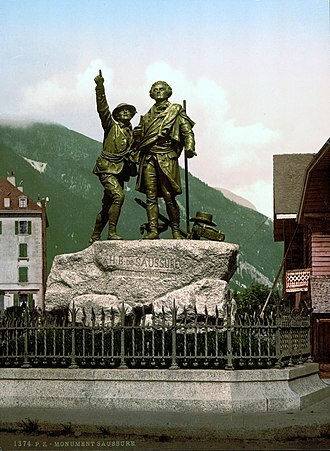 He was soon interested in mountaineering and decided to attempt the yet unconquered Matterhorn, Whymper soon found that Jean-Antoine Carrel, an Italian guide from the Valtournanche, had attempted to be the first to reach the summit of the Matterhorn since 1857. In 1865, weary of the defeats he had sustained on the south-west ridge, the stratification of the rocks on the east face seemed to him favourable, and the slope not excessive. However, when route was attempted, the mountain discharged an avalanche of stone upon the climbers. His guides refused to make any attempts by this route. In the meantime Carrel had spoken with Whymper and had engaged himself for an attempt on the Swiss side, Carrel was engaged to the Englishman until Tuesday, the 11th, inclusive, if the weather were fine, but the weather turned bad and he was thus free. On the morning of the 9th, Whymper, as he was descending to Valtournanche, was surprised to meet Carrel with a traveler, who was coming up with a great deal of baggage. Whymper was unable to make his attempt, and Carrel left him and came with me. 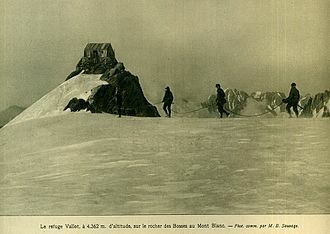 We immediately sent off our advance guard, with Carrel at its head, in order not to excite remark we took the rope and other materials to Avouil, a hamlet which is very remote and close to the Matterhorn, and this is to be our lower base. Out of six men, four are to work -up above, I have taken up my quarters at Breuil for the time being. The weather, the god whom we fear and on whom all will depend, has been hitherto very changeable, weather permitting, I hope in three or four days to know how I stand. Wood engraving is a printmaking and letterpress printing technique, in which an artist works an image or matrix of images into a block of wood. Functionally a variety of woodcut, it uses relief printing, where the artist applies ink to the face of the block and prints using relatively low pressure. By contrast, ordinary engraving, like etching, uses a metal plate for the matrix, and is printed by the method, where the ink fills the valleys. As a result, wood engravings deteriorate less quickly than copper-plate engravings, Thomas Bewick developed the wood engraving technique at the end of the 18th century. His work differed from earlier woodcuts in two key ways, rather than using woodcarving tools such as knives, Bewick used an engravers burin. With this, he could create thin delicate lines, often creating large areas in the composition. Second, wood engraving traditionally uses the woods end grain—while the older technique used the side grain. The resulting increased hardness and durability facilitated more detailed images, wood-engraved blocks could be used on conventional printing presses, which were going through rapid mechanical improvements during the first quarter of the 19th century. The blocks were made the same height as, and composited alongside, the combination of this new wood engraving method and mechanized printing drove a rapid expansion of illustrations in the 19th century. Further, advances in stereotype let wood-engravings be reproduced onto metal, by the mid-19th century, many wood engravings rivaled copperplate engravings. In 15th and 16th-century Europe, woodcuts were a technique in printmaking and printing. They were still made for printing press work such as newspapers or almanacs. The beginnings of modern wood engraving techniques developed at the end of the 18th and beginning of the 19th century, Bewick generally engraved harder woods, such as boxwood, rather than the woods used in woodcuts, and he engraved the ends of blocks instead of the side. Finding a woodcutting knife not suitable for working against the grain in harder woods, Bewick used a burin, from the beginning of the nineteenth century Bewicks techniques gradually came into wider use, especially in Britain and the United States. The modified technique in the wood engraving Crucifixion of Jesus by Gustave Doré. This original wood block by Thomas Bewick is made to type height so it could be used in a letterpress. The block shown from above. Notice the circular area marking damaged and repaired wood on the left next to the figure of a man. Plaque in Zermatt, commemorating the first ascent by Edward Whymper: On 14 July 1865, he set forth from this hotel with his companions and guides, and completed the first successful ascent of the Matterhorn. Tyndall's setup for measuring the radiant heat absorption of gases. (Click on image for a description). Tyndall's setup for preserving broths in optically pure air. One of Tyndall's setups for showing that sound is reflected in air at the interface between air bodies of different densities. With this setup Tyndall observed new chemical reactions produced by high frequency light waves acting on certain vapours. The main scientific interest here from his point of view was the additional hard data it lent to the grand question of the mechanism by which molecules absorb radiant energy. The Grandes Jorasses. Pointe Walker, Pointe Whymper and Pointe Croz (left to right). 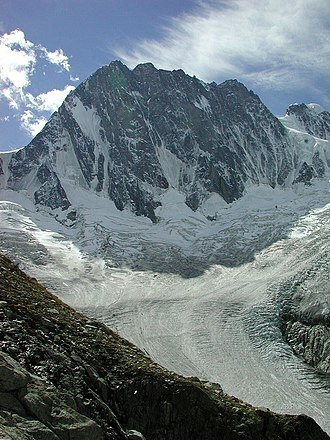 The Croz Spur is the buttress (centre right) on the north face that leads to Pointe Croz. Memorial to Lord Francis Douglas (top row) outside the Douglas Family Mausoleum, Cummertrees.